Articles and Projects, The Molder or Shaper? Choose the best tool for you! 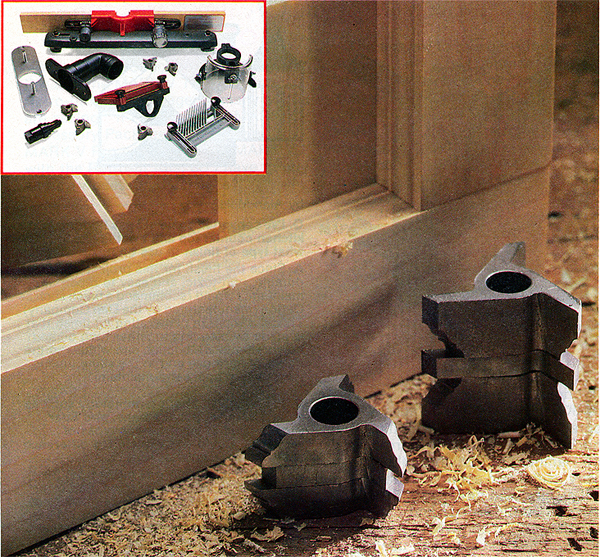 Molders and shapers are cutting tools that truly elevate woodworking projects to a new level of professionalism. Using either one of these unique cutting tools allows you to create, in your own shop, what the pro抯 produce in their factories. Not having a molder or shaper limits the potential of the woodworking you can do. Now when you look at the profiles available for molders and shapers, you may wonder just exactly what the difference is between the two tools. You抮e not alone. Both the molder and shaper have a lot in common � especially profiles � but just how you use these profiles does make a lot of difference. To clear up the issue of which tool is best for you and your projects, here抯 a short guide to the molder and shaper. The function of both the molder and shaper is to add decorative or functional touches to the edges and surfaces of wood. You抳e seen these tools used in such things as tabletop edges, window and door construction, glue joints, and decorative moldings in the home. To accomplish all these cuts, there are a wide variety of profiles available for both the molder and the shaper. Of the many profiles available, some profiles are unique to one tool or the other, but there are a wide variety of profiles available for both tools. As similar tools, molders and shapers are both capable of forming glue joints � an edge treatment that increases the gluing surface and provides accurate alignment when gluing stock edge to edge. 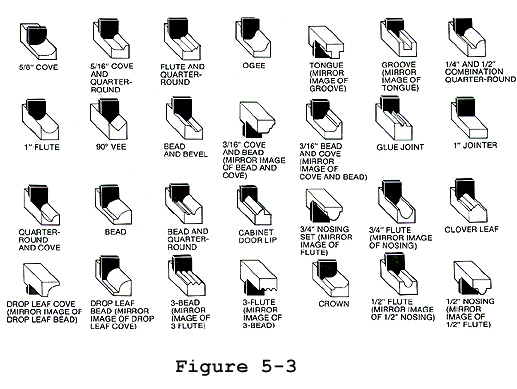 And both tools are capable of forming drop-leaf joints, window and door sashes, as well as a wide variety of decorative edge treatments like bead-and-cove, ogee, and cloverleaf. But even though the molder and shaper are similar as far as many of the profiles go, there抯 a big difference when it comes to actually using the tools and actually forming the profiles. First of all, the molder is a table saw attachment that mounts to the horizontal spindle beneath the worktable. A heavy steel disc holds three 1-inch wide matching cutting knives and this disc rotates at about 3500 RPM ("R" on the speed dial). Using the molder is easy. Simply set up the Mark V in the horizontal position with the lower saw guard in place. Mount the Molder Head (with the desired knife profile installed) on the 5/8" Molder Arbor. Then install this assembly on the headstock quill. Lower the table over the molder head. Next, place a special Molder Table Insert (Mark V 510, Mark V 500) in the tabletop and mount the rip fence to the table. The rip fence here guides the stock as it passes over the rotating molder knives. To mold the surface of stock, use a Push Block, to keep the stock flat against the table and your hands safely out of the way. 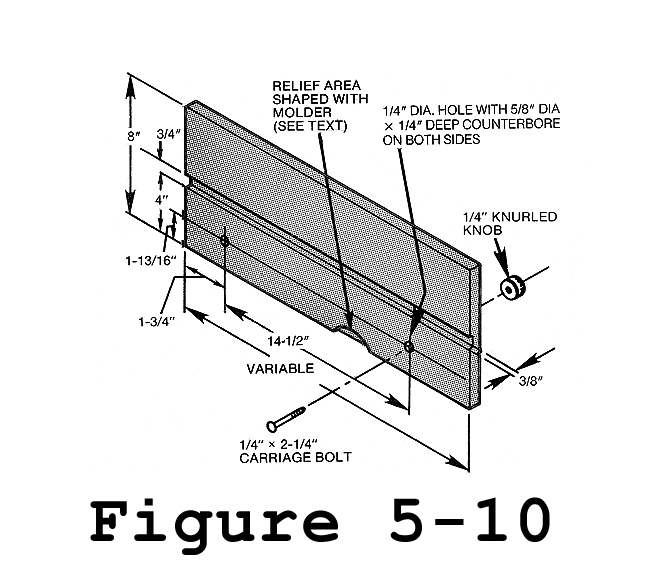 Figure 5-10 When molding the edge of stock, a simple wooden fixture is attached to the fence so the knives will not hit the rip fence. The molder is best suited for adding decorative touches to straight work such as custom room trim and picture frames. The shaper, unlike the molder, requires the Mark V to be set up in the vertical position. With the machine in the vertical position, the worktable is perpendicular to a 1-inch wide profiled three-lip shaper cutter mounted to an arbor. Unlike the molder, the stock is passed by the spinning cutter � not over it � and the stock is guided by the use of either a shaper fence or a rub collar with a starter pin. The Shaper is best suited for forming decorative edges on straight and curved edges. Since the ideal way to handle stock on a worktable is to have the stock flat � the molder and shaper each have distinct advantages and disadvantages. First of all, the molder is best suited for forming a profile on the flat face of stock as it抯 passed over the rotating knives. This application is commonly used with door and window frame moldings, picture framing stock, and surface treatments of furniture components like table aprons or chair rails. Forming a profile on the edge of stock is possible with the molder, but any stock over 5 or 6 inches wide requires the added support of a vertical fence extension. This extension is easy to make and greatly aids in the safe handling of the stock (Figure 5-10 for plans). When forming the end of a narrow but long piece of stock (like a door stile or rail), a special jig or accessory must be used. The major limitation of the molder is that it抯 only capable of forming profiles in a straight line since all stock must be guided with the rip fence in place. The strong suit of the shaper, on the other hand, is that the table is perpendicular to the cutter. This means that as the stock is held flat on the table, the edge of the stock can be safely profiled as it passes past the cutter. The shaper, when equipped with a special shaper fence, is capable of forming profiles on straight edges like the molder. But the major advantage of the shaper is that, when equipped with a starter pin and a rub collar, can form profiled edges on curved stock. And because the shaper is mounted on the main spindle above the worktable, it抯 possible to shape inside edges. With both of these edge treatments, the large worktable surface supports stock without the need of any special jigs. A shaper then is capable of forming the outside edge of a large oval tabletop or the inside edge of a round picture frame. Making a choice between a shaper or molder attachment may seem difficult � and it is for most woodworkers. Each attachment has its strong suit � the molder for surfaces and the shaper for curves. 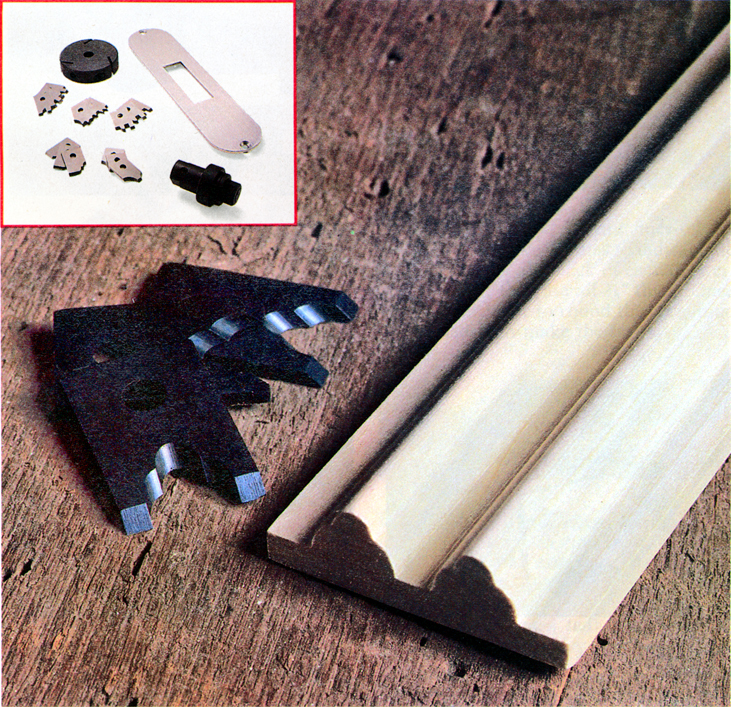 And each tool has a shared ability � forming decorative edges on straight stock. To help with the problem of which tool you need, look at the next project you want to build and get the appropriate attachment(s) for that project along with the required cutters or knives. 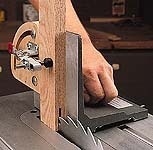 If you抮e going to be making, plaques, oval or round picture frames, or kitchen cabinets with curved rails, get a shaper. The addition of decorative edges to these projects would certainly add a real degree of professionalism to your work. If, on the other hand, you plan on making new trim for a remodeled room, picture framing stock, or straight decorative moldings for furniture pieces, select the molder. You抣l even find the molder great for adding decorative touches to porch railings, fencing, and a host of other outdoor projects. For more complete information on the molder and shaper, refer to 555069, Power Tool Woodworking for Everyone. Choosing the right tool for the job is important from both a safety and an economic standpoint. 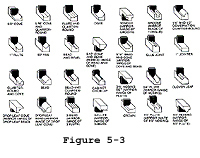 Look through the literature for the tool yu need. Remember that each accessory requires a special insert and mounting device � a 1/2" arbor for the shaper cutters and a 5/8" molder/Dado arbor for the molder head that holds sets of 3 matched molding knives. Whichever accessory you choose � the molder, the shaper, or both � you i find your woodworking taking on a whole new dimension.